A hearty welcome from tribes decorated in vibrant beads, long-legged pink flamingos, safaris with lions and leopards, newborn Rothschild giraffes, chubby baby elephants in mud baths, scrumptious campfire food are all only some of the reasons that make us feel we have stepped into Dreamtime. 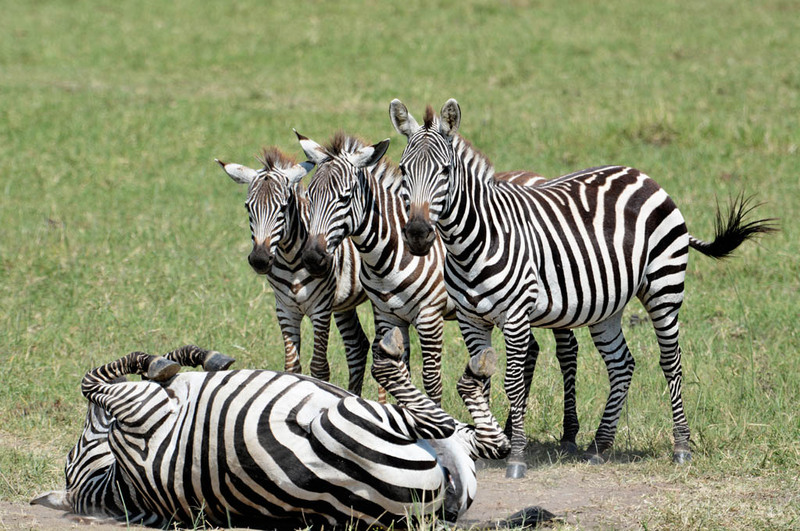 Kenya will enchant you and put you under its spell. During our time in Kenya, we always felt safe. While out in the national parks we had no reason to worry. When stopping for coffee or groceries in a shopping centre we always felt secure. Kenya’s authorities have dealt with terror threats and there is strict security at airports and security and police at supermarkets, outdoor markets and public gatherings. Most travel advisories relate to the non-touristy areas in the border areas between Kenya and borders of Ethiopia, South Sudan and Ethiopia. Like any country with extreme poverty, there is petty crime. Be cautious and minimise yourself as a target. 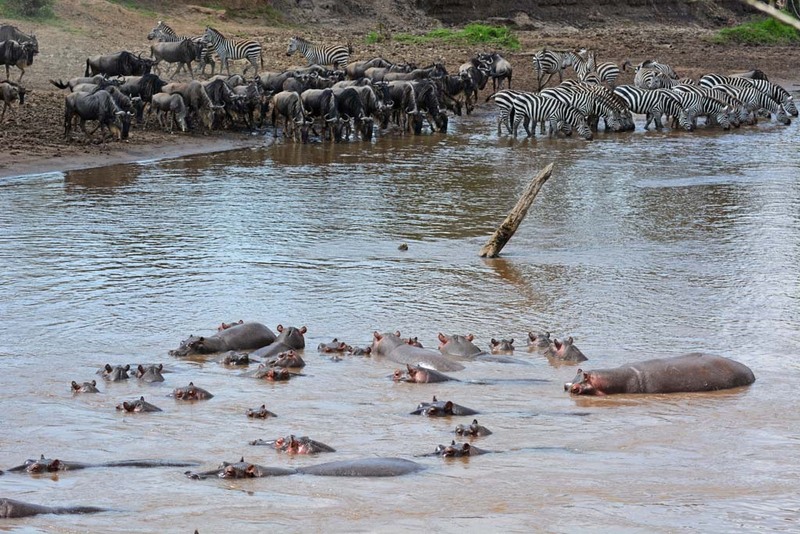 Thousands of tourists visit Kenya’s wildlife parks every year without incident or worry. Our accommodation in Nairobi was the Wildebeest Eco Camp. 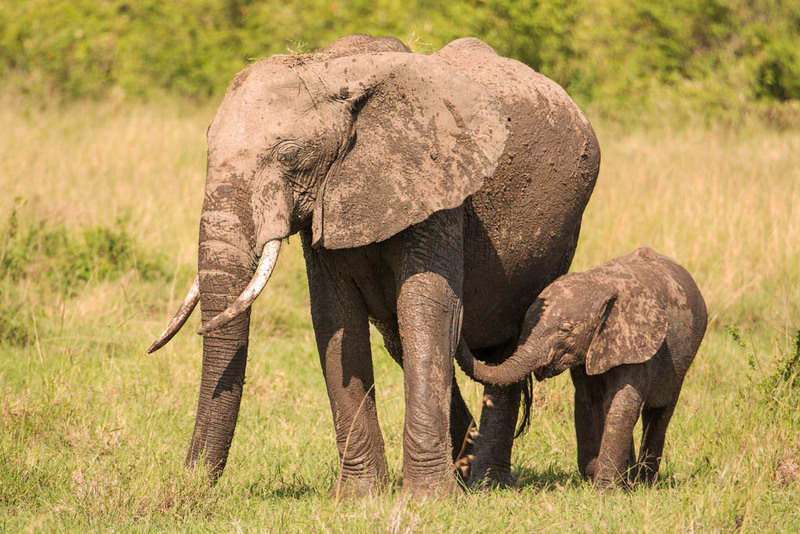 It is safe and secure and only a short drive from the airport and the Elephant Orphanage. The tents with ensuite are cute, clean and good value. Breakfast is included and the buffet meal served at night is very nice. Daytime temperatures average about 23°C at higher altitudes and 30°C at lower altitudes. At higher altitudes such as Masai Mara and Lake Nakuru, it can get cold especially during June, July and August. Temperatures can drop below 10°C at night. The days are beautiful and sunny with clear blue skies. Some of the parks and campgrounds can get very crowded during these times. Some lodges and camps close due to the wet and road closures. 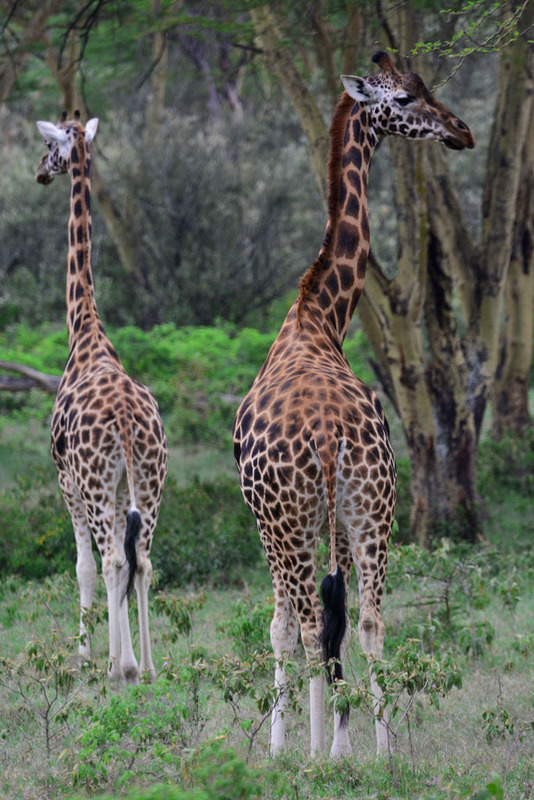 Rothschild Giraffe sightings at Lake Nakuru are a highlight for us. 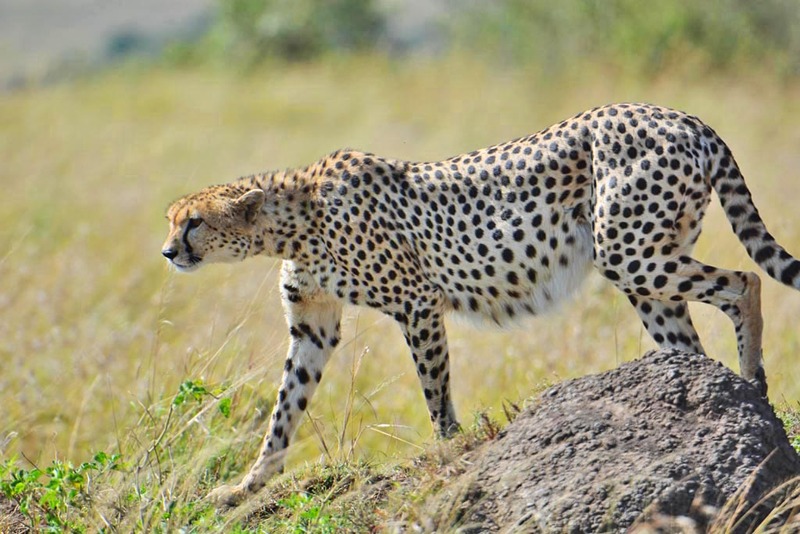 During the dry season, the wildlife is easier to spot as the landscape is dry and the bushes and grass are not too high. The wildlife go to water and rivers, making the sightings more regular. The wildebeest migration arrives at the Masai Mara in July and returns to Tanzania in October. During the wet season, it is beautiful and green, and there is still plenty of wildlife but it is harder to spot. Some migrant birds return and newborn animals including thousands of baby antelopes arrive around November and December. It is also a good time to see Lions. Except for March, April and May the rains are short and only in the afternoon and night, and rarely spoil a safari. November and December are a great time because you will often have the parks and the sightings all to yourself at a lower price! We were there in early July which is the beginning of the dry, high season which goes until October. The Great Migration happens during this time and we were at the very start of it. The currency is the Kenyan Shilling. ATMs are readily available but many won’t disperse the cash. We found Barclays and Standard & Chartered the most reliable. Many ATMs in Kenya still have the old magnetic strip technology, which can cause problems with your bank. We’re told they will upgrade to the new chip technology by the end of the year. We brought the required US Dollars with us and withdrew the majority of our Kenyan Shillings at the airport ATM on our arrival. Being a vegetarian in Kenya is easy and the food is scrumptious. The locals cook with a lot of couscous, rice, pasta and make use of any fresh produce in the area. Following is some of their local vegetarian dishes which we had a lot of while camping. Sukuma wiki – Spinach, tomato and onions fried with salt. Vegetable stew – Served at most local restaurants and often accompanied with rice. Ndgenu – Bean stew made from mung beans, tomato, and onion and deliciously seasoned. Chapati – Round flat pan-grilled bread that is the perfect accompaniment to the vegetable and bean stews. It is often sold with fried eggs rolled into the chapati. Before going on safari remind the company or guide in advance if vegetarian, vegan or other food is required. Most hotels serve a western breakfast of cereal, toast, eggs and fruit. In the cities, there are a good choice of Kenyan, western and international restaurants that serve vegetarian. Abyssinia Restaurant serves authentic African and Ethiopian food and has vegetarian on their menu. The juice is always freshly squeezed and the coffee is divine. Clay Oven Restaurant is an Indian restaurant that specialises in North Indian cuisine that even make cauliflower taste scrumptious! Do your research for reviews and recommendations on companies and guides before booking with them. We watched group tours and guides that had a checklist to complete. It was a mad rush to see as much as possible in a short time. It didn’t matter if it was only the backside of a lion; as long as it’s seen, it’s ticked off the list. 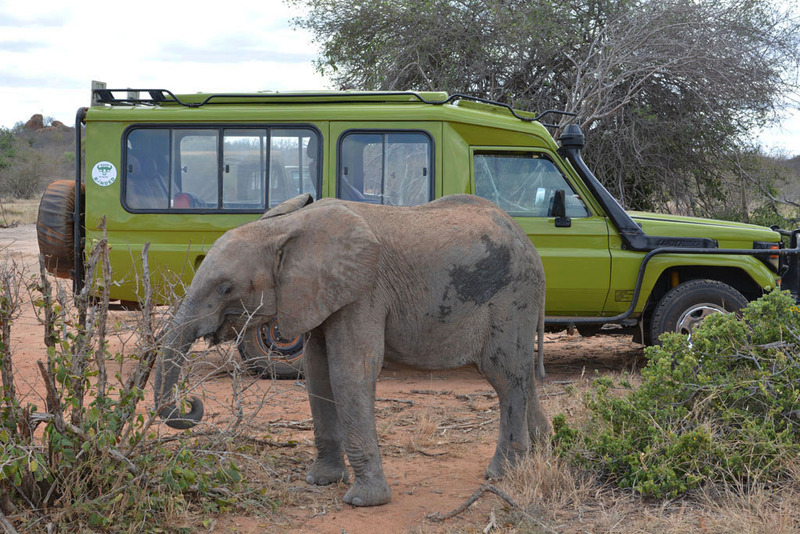 Ask questions – find out what sort of safari vehicle, how many guests will be in the vehicle, where your campsite or lodge is in relation to the park, is there a time restriction at wildlife sightings and what time will you be in and out of the park. Our guide Martin hired an extended Toyota Landcruiser Troopcarrier. It was huge but ideal for the trip. Martin took out the middle seat so it had heaps of room for camping equipment and photographing on game drives. There was no shoving for the best position on this trip! The landcruiser has a pop-top that provides shade, a must for game drives. We spent most of the time standing and photographing so shade and rain protection was essential. Wildlife can be missed while a person is sitting down inside. A lot of other vehicles had the open-top but no shade roof, so everyone was sitting down inside to avoid the heat. A smaller 4WD can be hired to cut the price down. Martin our guide would take us back to the lion sightings in the late afternoon. Consider if you want to go as part of a group or privately. 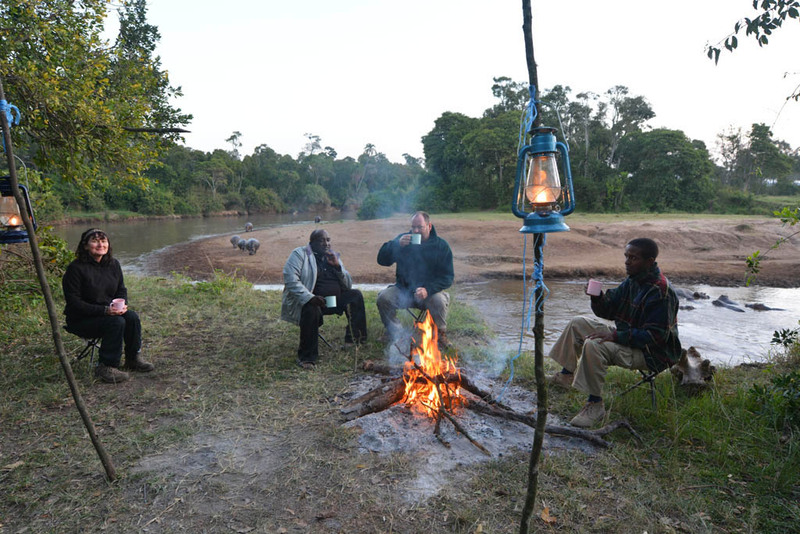 Group safaris are often less expensive and can attract like-minded people and you can form lifelong friendships. A private safari is usually more expensive but a lot more flexible. Going private and having our own guide was worth the extra money to us. The ultimate was having our own vehicle as we were in full control of where we went and how long we spent at sightings. It was up to us and not in the hands of a group of strangers to make decisions for us. Our campsite in the Masai Mara was Ndovu. 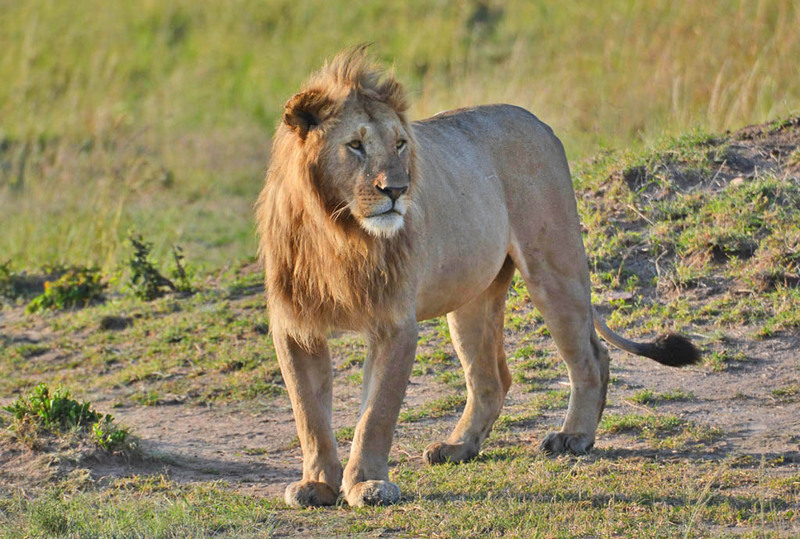 It is on the Oloololo gate side, away from the crowds of the busy and more commercial areas of the Masai Mara. 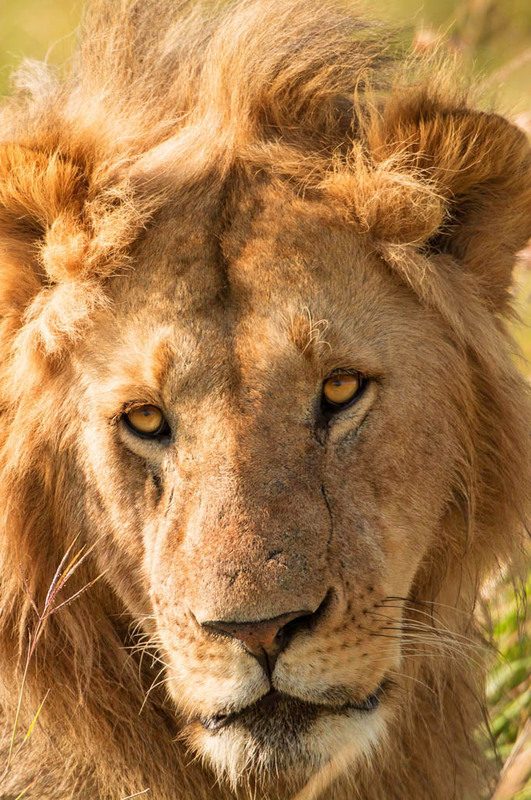 This allowed us to have some of the lions and other sightings to ourselves, rather than sharing them with up to 30 plus vehicles fighting for positions in the busier areas. Most locals don’t mind having their photograph taken if you ask their permission beforehand. 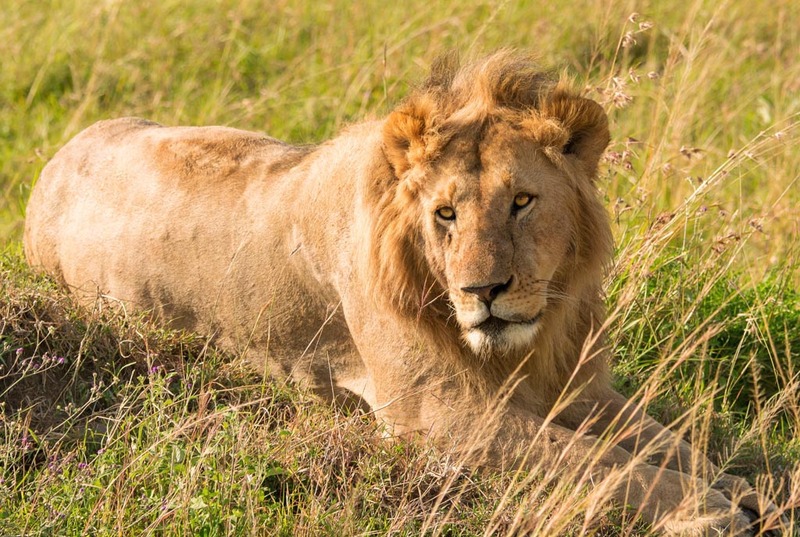 The actual sightings of the lions were many, but the felines are usually sleeping and obstructed by the grass. Sometimes it requires patience and a good guide to wait until they move. Sometimes we would continue game driving and come back to the location. Usually, the lions would move around 6-6.30 pm. Camping inside the park was a bonus as we could stay late, where other vehicles had to leave well before the park closed at 7 pm to get back to their accommodation. The same at sunrise – we had the park to ourselves. Our 400mm lens was adequate for photographing most of the wildlife. A 600mm lens would have been perfect for the flamingos though! We suggest a lens hood as the wildlife is often in harsh light or the side of the sun. Originally we had a UV filter on the lens, but we found that when the lens is extended out, the quality and sharpness of our images is lost. We’d rather have no filter and just look after the lens. The lens hood does help protect it. A small and collapsible tripod or a small bean bag tripod is a practical choice for travelling and on safari. Rooftop camera mounts are another option for the more serious photographer. A set of a good pair of binoculars is a must have. Don’t ask how far somewhere is in kilometres as it can be misleading due to the road conditions. Ask how far in hours or minutes. 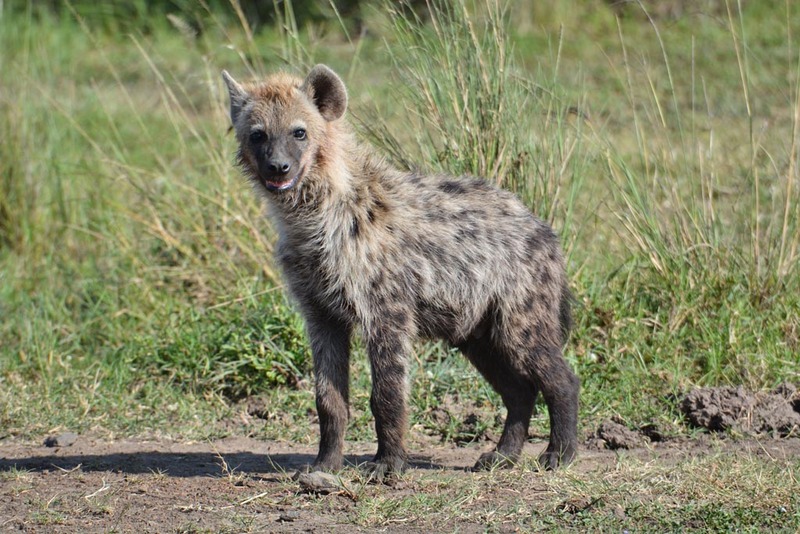 This hyena pup wasn’t allowed back in the den while we were watching. We advise that you pack at least one set of light warm layers. It should be something you can easily take off when it warms up later in the morning. The cold and wind combined can make it freezing on the game drives, especially if you start early in the morning. The wind can dry out lips and skin, so bring plenty of lip balm and moisturiser. A hoodie is also a good idea. Bands or clips come in handy to tie back long hair as the dust and the wind on safari drives can cause chaos with it. It can get very dusty on the game drives, which adds to the drying conditions. A dust-proof bag is essential for all photographic and electronic equipment while travelling. View from our campsite in the Masai Mara. Our trip was in early July which is the very start of the migration. HerdTracker is a real-time Google map that tracks the migrating wildebeest exact location in the Masai Mara and Serengeti. We never had this but it sounds awesome. No one can predict exactly when the wildebeest migration will start and finish but generally, they arrive in the Masai Mara in July and depart in October. September is often a good time as the migration is in full mode and wildebeest are seen as far as the eye can see. 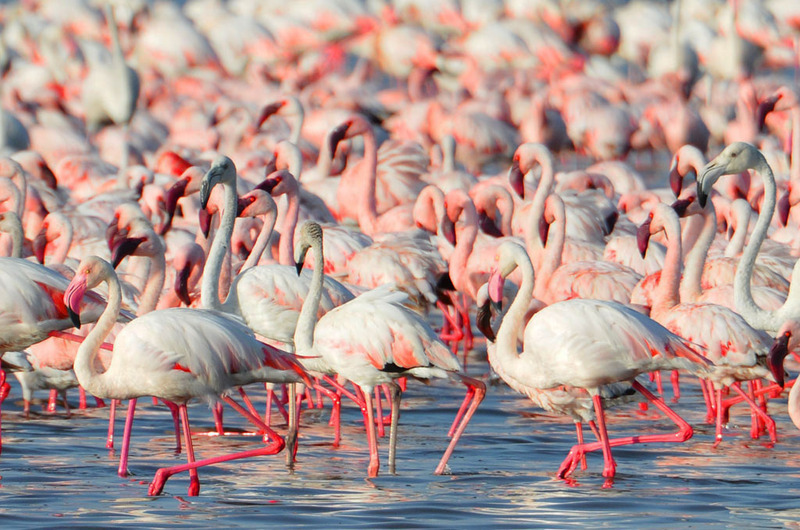 The flamingos at Lake Bogoria are an enchanting sight. The location of the flamingos can no longer be guaranteed. Because of climate change and flooding, they have fragmented and can move daily. The afternoon before our visit, our guide Martin made a phone call to confirm they were at Lake Bogoria. When visiting the flamingos at Lake Nakuru, Lake Bogoria or any of the other lakes try and get there early, but not too early, as they can be spooked in the dark and fly off! Get there immediately after sunrise and be the first to arrive because the flamingos can be startled by crowds and fly off or move from the shoreline. If you arrive later, there is a possibility of missing them. 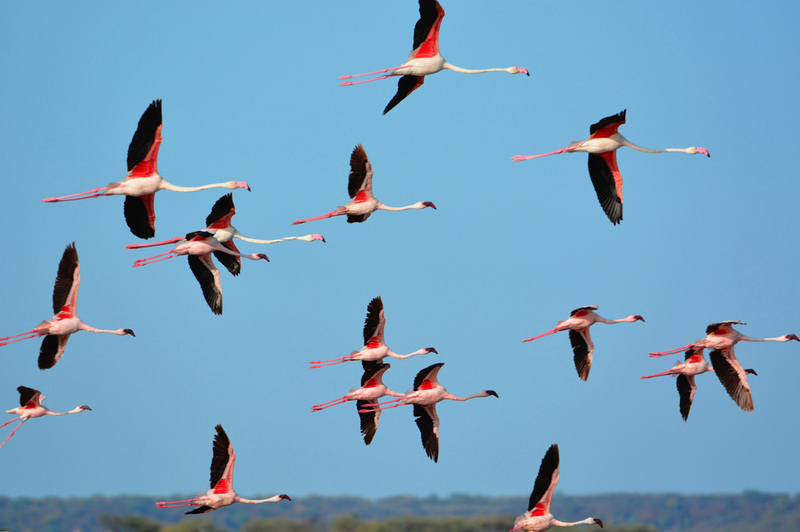 It’s magical to see the flamingos in flight. The park fees in Kenya are expensive, but you have to pay them no matter where you stay. They are sometimes not included in the advertised price of accommodation, so make sure you check this. 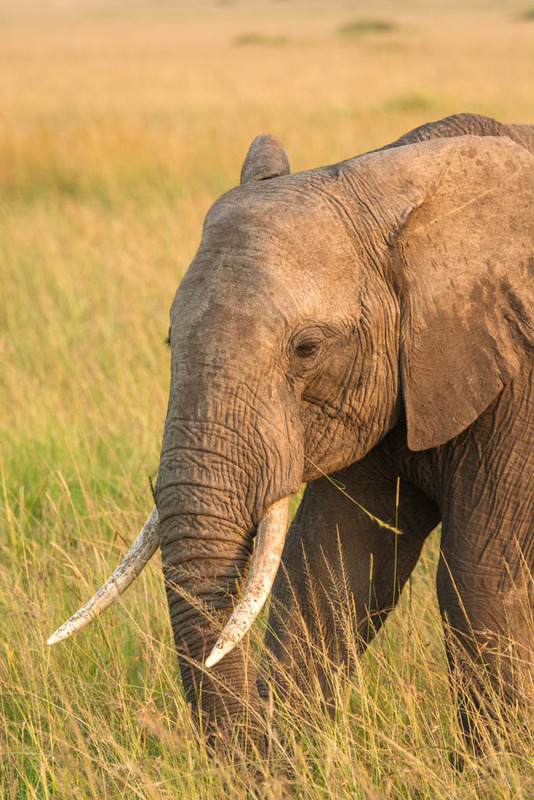 If the fees are what it takes for Kenya to protect their wildlife, we consider it a small price to pay. If you’re not that keen on camping, there are many accommodation options in and outside the park, from backpacker accommodation to 5-star luxury lodges. You can stay at any of these and still have the private services of a guide for guiding, game drives, and transport. 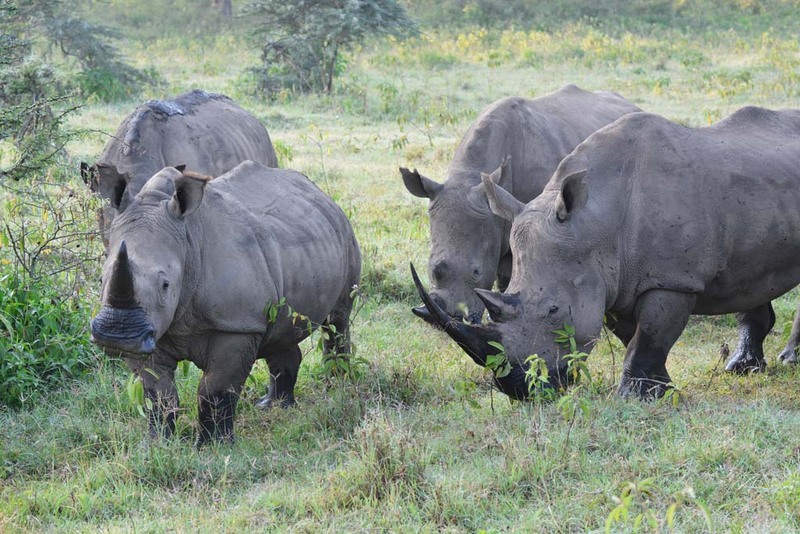 These rhinos came right up to our vehicle at Lake Nakuru. We don’t go anywhere without our mini Ipads as they are a perfect size and make the best kindles. We both love reading and download heaps of books which are so much cheaper than hard copies and so easy to carry. Also, they are perfect for camping and reading in the tent at night, as no lights or torches are necessary. The Kenyan power supply is 220 Volt 50Hz and Type G plug. Water is NOT drinkable. Drink only bottled or treated water. WiFi is scarce. We bought a local sim card for our smartphone and used it as a hotspot for internet. We paid $10 for 3GB of Data. DON’T FORGET YOUR YELLOW FEVER VACCINATION & CERTIFICATE because you are not allowed out of the country without it! This is such an informative blog. You’ve done right by the animals, the country and the tourist industry. Not to mention your followers! Once again I enjoyed the ride on your word images AND the photos! You took me there. And at no small effort on your own behalves. The blog is so jam packed with the variety of animals and changing scenes, it is easy to see it was a ‘working holiday’ for you. And that you loved every bit of it. Not that the comfort wasn’t available, you just didn’t opt to get out of the wind or rain if it meant missing the magic! You have the gift of seeing what many miss. Thank you for sharing it. Thank you Gypsy.Kenya is a beautiful country. The wildlife and people are amazing. We will definitely be going back if we ever have the opportunity! My wife and I were fortunate enough to go to Kenya in 2002. We were also fortunate that we were the only two people on the safari and thus had the whole vehicle(8 seater bus), the guide and the cook all to ourselves for the 10 days of the safari. We camped in the national parks and that was probably the best part of the trip because you are out there 24/7 and see and hear everything that happens, including having lions around the tent during the night. If you have to go to the toilet at night, that can be interesting. The best part of being the only clients was that we could stay and watch a leopard sleeping as long as we wanted, or simply watch giraffe browsing without consulting anyone else about their preferences. Our favourite park was Samburu where we got to see Kaminyak the lioness who tried to adopt several Oryx calves. Sadly she disappeared just after we left. I am so looking forward to going back soon. By the way,our visit to the elephant orphanage was wonderful. Hi Ian. Thanks for your comment. Lucky you to get the safari all to yourself! We would never do it any other way. The guide to ourselves, the cook & not to mention all the wildlife! Yes, going to the toilet at night is interesting but all part of the adventure! It would have been a great experience to see Kaminyak and it is so sad she has disappeared. 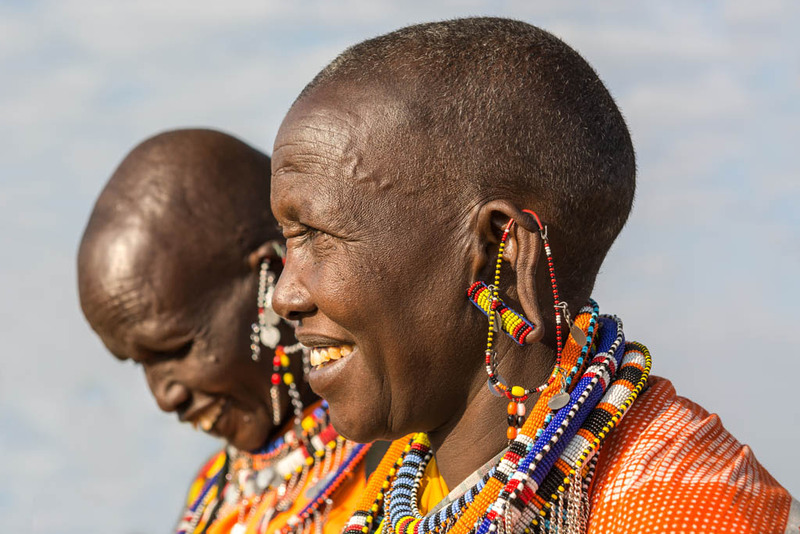 We never made it to Samburu but that is definitely on our list for our next visit to Kenya. It is too much of a beautiful country not to go back. Hi Christine. Thanks for your comment. The toilet was away from the tent and was bush style with a hole dug in the ground. This is what a lot of bush camping in Africa involves and this was by no means a luxurious camp. Depending on your budget you can go more upmarket if you want. 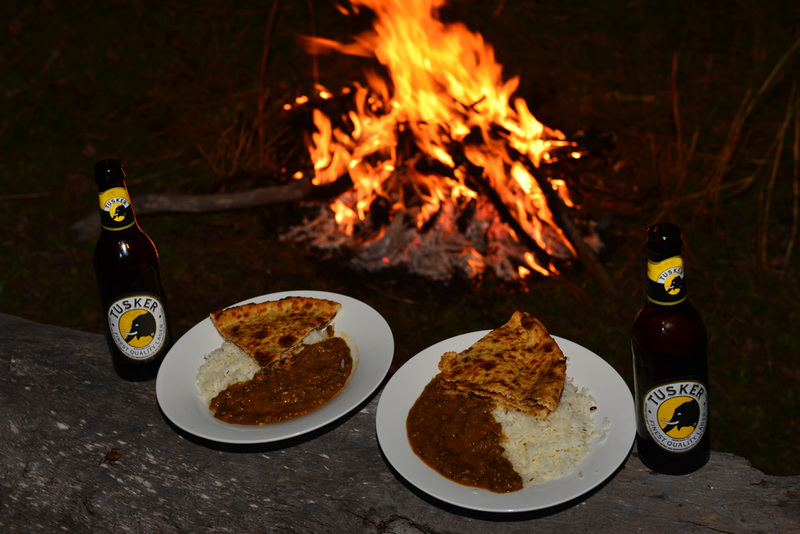 If you go on a private camping safari, it is up to you what camping equipment you hire. 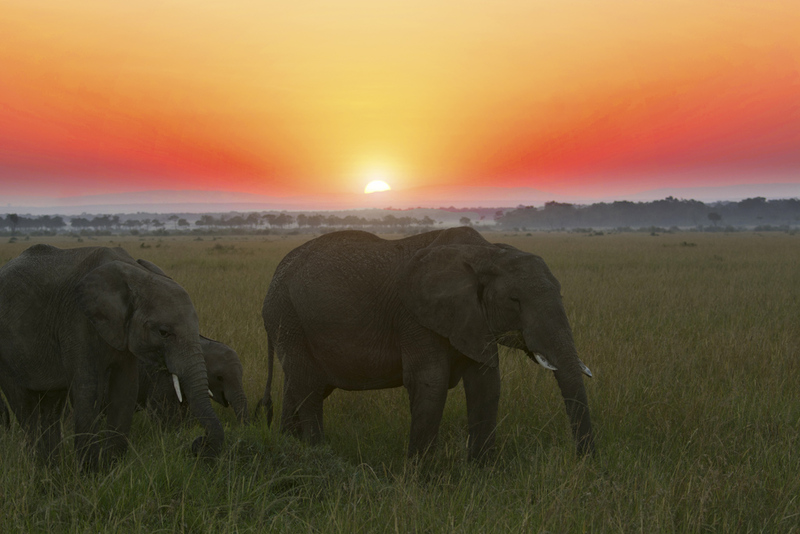 No matter what way you choose to go Kenya is a magical destination! Great article! Kenya is one of the places that I want to visit the most in Africa. I’m sure that this information can be very useful for me when I’m finally starting planning a trip to Kenya. Thanks for sharing! Hi Bilyana. We hope our information can be helpful. If you have any questions don’t hesitate to get in touch. Thanks! Good Evening! I have stumbled upon your website as I prepare for my trip to volunteer in Kenya in June-July. We’re going on game drive and I am looking to upgrade my camera. What camera did you use for these photos? They’re beautiful! Hi Taylor! Thanks for your comment and visiting our site. I (Sue) have a Nikon D7100 and Ray has a Nikon D800. Any other questions, please don’t hesitation to contact us again. Thank you so much for the reply, Sue! Is there a camera you would recommend more than the other? Anything you dislike about either of the cameras? I have a Nikon D3000 right now and it just doesn’t take the best quality photos. I was in Korea in September and the photos I took just weren’t as sharp as I would have liked them to be. To be honest Taylor, the only difference that I see in the images is the D800 file size is a lot bigger. By just looking at the images I cannot tell which camera they were taken from. The D7100 also makes an excellent video camera and is highly rated for this. Hope this helps!